Hm, so what does that mean? Basically what you can with the little Arduino board is easily bring lots of input in and turn it into certain outputs. Sounds easy and maybe trivial but really is not. 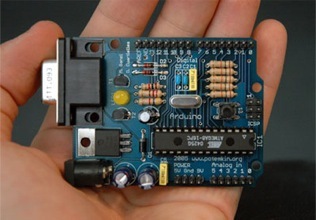 Because Arduino can process many different signals and trigger many different outputs. Kiss a door and it opens. Step close to a mirror and a video starts playing with the mirror talking to you. Turn TV picture into LED-signals. Connect it to the Wii and In general one might say it’s very nerdy and looks a little unready still. But it’s definetly the start into a development of selfbuilt robots and machines. Below are some video examples. I particularly like the TV to LED part because it’s kind of what a friend and I did for a party once. We put 16 toilet paper rolls covered with translucent paper in fornt a tv and thus reduced the pictures to a 16×16 pixel screen. We taped it to video and had a nice party light installation. The posted below is slightly more elegant but, really, less charming.